📡 Christian is actively writing this recap (if you listen closely, you can hear him furiously typing at the front of the room). Keep this page open for live updates. Marketing geek @thrivethemes, I love funnels, CRO, taking screenshots and listening to podcasts. Flow chart for triaging feature requests. If Henry Ford had asked his customers what they wanted, they would've asked for faster horses. Would less than 1% of your users be interested in this feature? Are the people asking for the feature early adopters? Customers will sometimes ask you for features that aren't core to your business, like making a Paypal competitor. When you get these requests, integrate with a trusted service that solves your customer's problems. Customers will often ask you for nice-to-have features, like Grammarly integration. If the feature wouldn't make a difference in the buy/not buy decision, and isn't something people would talk about in product reviews, it's a Wash-a-Pig request. Faster Horse requests have a bigger-picture problem to be solved. The Faster Horse request is the hardest one to recognize because it makes sense. 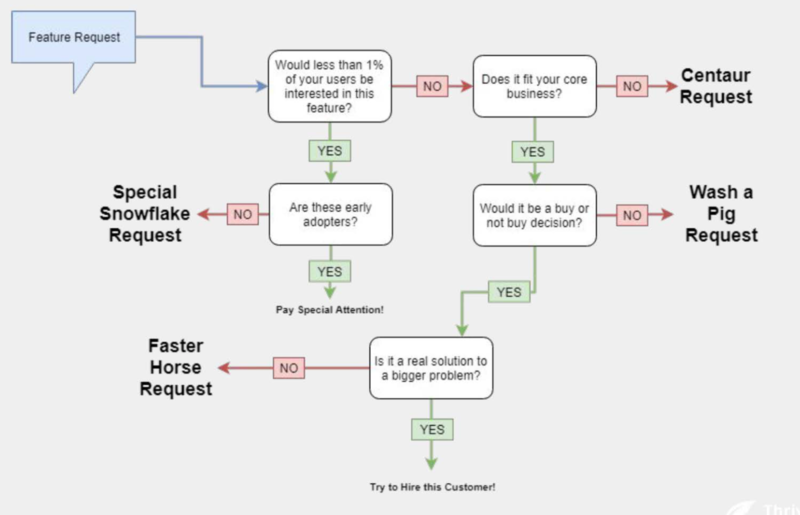 To identify Faster Horse requests, evaluate if the feature request could be satisfied by solving a bigger problem. For example, a customer asking Henry Ford for a faster horse is actually asking for a faster way to get places. Instead of implementing every feature customers ask for, do things that don't scale. On the call, shut up and listen. A great open-ended question to ask is "if you had a magic wand to solve this problem, what would that look like?" This takes customers out of the limited mindset of thinking practically. Thrive Themes evaluates new features by looking at how much it would increase revenue, customer value, strategic value, efficency, and innovativeness. 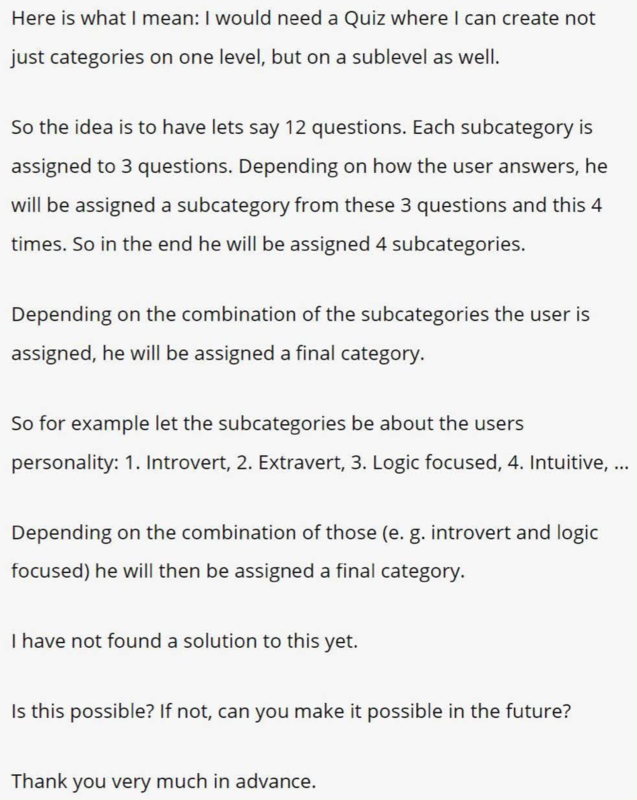 From those customer interviews, you'll extract ideas for features. 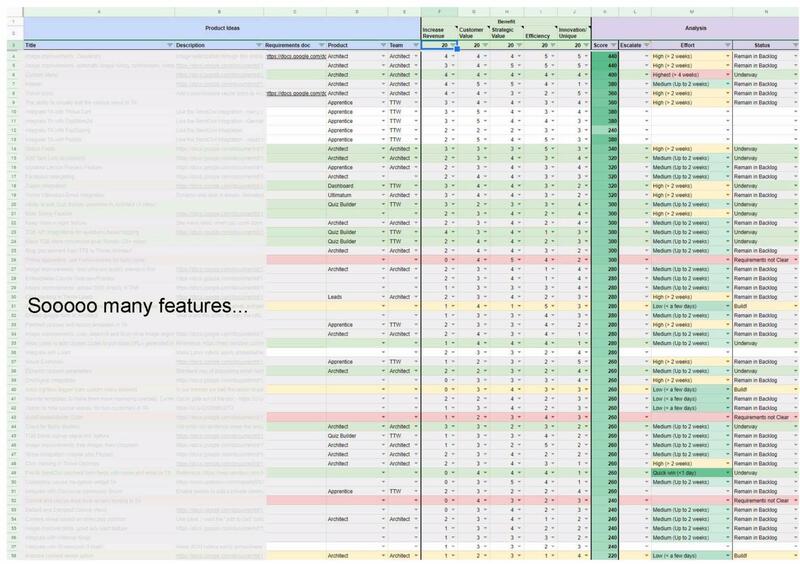 Organize those features in a spreadsheet to evaluate which features are the best to implement next. Weight features against eachother by what is important for you. Thrive themes values impact on revenue, customer value, strategic value, efficency, and innovativeness. How do you get accurate rankings? They're estimates - go based on your gut. How do you manage a public roadmap with customer expectations? We don't have a public roadmap. Our users don't know the exact features they want, and we prefer to capture their problems. How do you respond to customer requests? If it's a special snowflake request, we just thank them. If it's a faster horse request, we say we're working on the problem. How many feature requests do you get each month? Have you ever launched a feature that you regretted? Yes! Bad features generate a lot of support requests. Because our product is a wordpress plugin, it's difficult sometimes to see if a particular feature is getting used. Why do you look at effort after the fact when evaluating features instead of including it in the score? We wanted to make sure we didn't eliminate features just because they were hard to build. I'm sending out a beautiful PDF eBook of notes from every MicroConf Starter and Growth talk – both Speaker and Attendee. Want a copy?